Past and present West Bengal communist heads will be called in for questioning for their alleged role in the massacre of 16 monks and a nun of Ananda Marga in Kolkata in 1982. 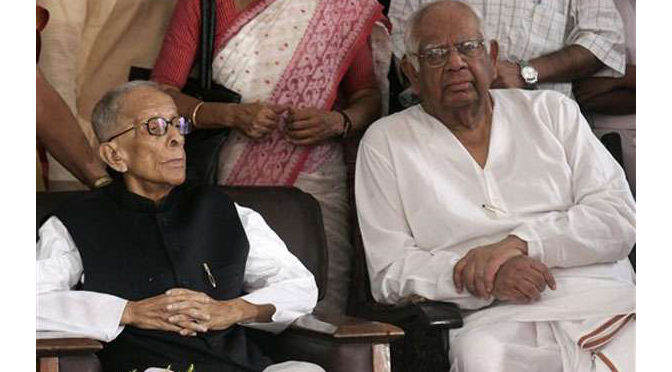 Photo: The late communist chief Jytoi Basu, Chief Minister of West Bengal 1977-2000 (left) with former WB Communist Party leader Somnath Chatterjee, one of several former communist heads who will now be questioned over the Bijon Setu massacre. (June 2015) – Past and present West Bengal communist heads will be called in for questioning for their alleged role in the massacre of 16 monks and a nun of Ananda Marga in Kolkata in 1982, sources in the Justice Amitabha Lala commission, formed to probe the massacre after the Trinamool government came to power in 2011, told Indian media. Justice Lala told Hindustan Times his probe focussed on certain communist leaders who reportedly had made provocative speeches, branding the Ananda Margis child-lifters, at a party-organised convention on February 6, 1982. A major source of information for the commission was the deposition of Sher Singh, then additional district magistrate of 24 Parganas, who claimed he had come to know about the plan two months ahead and alerted his boss, district magistrate Ranu Ghosh on January 16. But no step was taken to stop the killings. The reason for the massacre was the PROUT philosophy propagated by the organisation, Singh told. The Ananda Marga organisation supports PROUT throughout India and the world. The Indian media, such as the Indian Express, displays an increasing interest in the case that was hushed up for decades until recently.